Who rules the internet? Some would say it’s a tug-of-war between tech companies and governments. Programmers vs lawyers. But more powerful than both are poets. There would not be communication satellites, unless Arthur C Clarke had described them in fiction decades before they came true. No web without the hallucinations of William Gibson. Likely no social media without Neal Stephenson. But none of these writers have had a more profound influence on the internet than John Perry Barlow, who proves Shelley right with a single text. 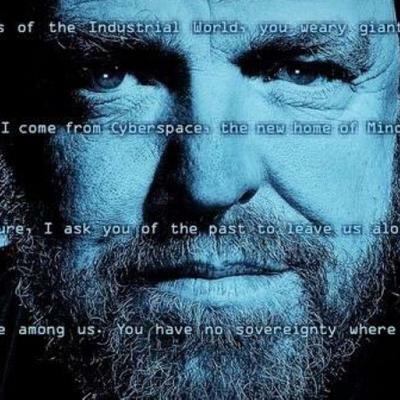 John Perry Barlow’s Declaration of the Independence of Cyberspace made the norm for what is possible to say and think about the internet. He has many followers, but none has words like his. “You can’t stop new technology” is nothing compared to Barlow’s “you weary giants of flesh and steel”. “The internet is a force of nature” pales by his “I declare the global social space we are building to be naturally independent of the tyrannies you seek to impose on us”. “Governments will break the internet” is a bleak imitation of “Governments derive their just powers from the consent of the governed. You have neither solicited nor received ours.” Read it. Weep. He wrote it in 1996 and only now, more than two decades later, are different ideologies around what the internet is and could be beginning to form. The Declaration was so powerful, it stopped the critical ideological thinking, instead turned a generation of digital intellectuals into loyal disciples, spreading the gospel rather than challenging it. I disagree with each word of the Declaration. I am awed by its beauty and power. Perhaps there was a time when Barlow’s vision could have been realised into something as great. But this was not how it turned out. Not the weary giants of flesh and steel, but the new shiny masters of huge data and artificial intelligence rule the new world, just as selfishly and jealously as any government. Today, it is 22 years to the day since the Declaration was written. John Perry Barlow passed away in his sleep the night before last. May he rest in peace, knowing that the impact he made in his lifetime shaped the world. Now, it is for us to come up with a new vision to succeed his. We can only wish to express it as eloquently.